Longboarding is a passion . If you’re like me, you may have gotten hooked the moment you first put your feet on a longboard. Or, you may just feel the itch to give it a try but you’re not yet ready to fork out a lot of money on a board. Is it possible to get started with serious longboarding by buying a cheap longboard ? Well I think so. In this post, I am going to explain why. We’ll start by reviewing some key criteria about what makes a quality longboard, so you have something against which to rate the “cheap” longboards you may be considering buying. Next, we’ll take a closer look at 10 popular cheap longboards I’ve selected based on these criteria. But first, let’s do a bit of scoping. Cheap longboard : what exactly do we mean ? The focus of this article is on all the serious (and wannabe serious ) longboarders out there. For this reason, we will not be considering what we might call “toy”, “disposable”, or “wallmart” longboards, i.e. longboards under $30. These products typically have some plastic parts that, most of the time, won’t hold out for long and won’t provide the true pleasure of riding and turning on a real board. As far as I’m concerned, decent inexpensive longboards for a serious rider typically fall into the $40-$60 price range. That’s the price range we’ll be looking at in this post. So you get the idea : our goal is to look at “cheap” longboards as in “inexpensive”, not low quality. OK, with this out of the way, let’s examine what makes the quality of a longboard. Which factors define a longboard’s quality ? These are the factors that keep coming back when judging the quality of a longboard – including in my short reviews further down. Without going deep into each part, let’s briefly look at what makes each part a decent choice or not for our inexpensive longboard. What makes a quality longboard deck ? Most longboard decks are made by pressing together vertically laminated layers of maple or Birch wood, bamboo, and/or composite materials such as carbon fiber. In the price range we’re looking at (under $60) most decks will be made from maple wood laminates, maple being the most abundant and durable wood around – although some decks may get a bamboo outer layer for looks. Materials determine the deck’s durability, weight, and flex amount. Maple decks (when pressed right) are very durable. They are also heavier than bamboo or composite decks. The number of laminate layers (plies) plays a role in the board’s quality and feel. Fewer layers means less weight and more flex, more layers means more weight and a stiffer deck – flex may be good or bad depending on your riding type. In summary, pressed maple decks are generally durable, but quality also depends on the number of plies and the pressing process used. Decks come in many shapes, symmetrical or asymmetrical, pintail, square tail, round tail. Overall shape is not an indicator of quality, but features such as concave (curved surface along the deck width) or camber (curve along deck length) help improve riding quality. Cutouts and wheel wells, which are cuts or channels in the deck meant to make space around the wheels so they won’t touch the deck as easily in sharp turns, also add to a deck’s quality. Quality of the trucks is a crucial aspect of a board’s overall quality. The trucks largely determines the boards stability and turnability. Quality trucks are made mostly of aluminum to reduce weight, and hence the longboard’s total weight. Most also contain alloy for durability. Less supplemental metal often leads to faster aging. Truck dimensions are important because they impact the likelihood of wheelbite during turns – where the wheels get in contact with the deck, bringing the board to a brutal stop. Wheelbite is a serious problem especially when riding fast, and can greatly affect the quality of your board. A longboard’s truck should have roughly the width of the deck, something to look out for in an inexpensive longboard. Most longboards with decks 9” or wider have hanger width (reflecting truck width) of 180 mm. Ability to turn is another indicator of quality. It depends on many factors, such as stiffness of the deck, tightness of the trucks, and truck height (higher the trucks often get less wheelbite). Just because an inexpensive longboard doesn’t turn well, however, doesn’t necessarily mean it’s low quality. The board may be designed for stability at the expense of agility – as is the case on some long-distance cruising boards. Cheap longboard trucks may use “reverse kingpin” or “traditional kingpin”, referring to the orientation of the truck (trucks kingpins facing each other or not). RKP trucks are higher and better turning. Here again, just because an inexpensive longboard uses traditional kingpin trucks does not necessarily mean it’s a low quality procduct – that may be a design choice e.g. for freestyle. The bushings are rubber parts around the kingpin and between the truck’s main parts, that act as cushions. The quality of bushings plays a role in overall longboard quality as it impacts the board’s turning ability and speed handling. Quality longboard wheels are made of polyurethane, with as little plastic as possible (which lessens performance). When choosing a cheap board, look for all-urethane wheels. Even with decent construction quality, it’s important that your wheels have an appropriate size for the trucks they are mounted on. Larger longboards have larger wheels – typically 70mm diameter by 40-65mm width. Bigger wheels can cause wheelbite in turns, affecting overall riding quality. This, however, can be fixed by adding risers between deck and trucks, or by switching to higher trucks. Wheel hardness (durometer) and shape may also affect the perceived quality of a longboard. However, choice of wheels much depends on the kind of riding you do – cruising, carving, freeriding, speed, or tricks. Therefore, be careful not to discard an inexpensive board as being cheap on the basis of its wheels alone. Bearing are the metal parts that let the wheels spin on the axle. Low quality bearings impede the wheels spinning freely – shorter spin time because of higher friction. The performance of low quality bearings decrease over time, whereas quality bearings often get better after some initial breaking in. Bearing precision is measured by the ABEC rating. A cheap longboard should have at least a standard ABEC 5. ABEC 7 bearings are supposed to be very fast, and ABEC 9 super fast. However, other factors, such as bearing material, are at play, so the ABEC raing alone is not sufficient for judging quality. The best test is to give the inexpensive board a hard push on flat ground and see how far it rolls. Grip tape is the rough adhesive you put on top of your longboard deck to prevent slipping and give you more control in riding – in combination with the deck’s concave and/or camber curving. Quality grip tape will grip well and won’t wear off quickly even if you ride hard. So that’s our quick tour of the quality aspects you should look for in a cheap longboard. Now let’s apply these criteria to a selection of popular longboards available on the market under $60. The following is a highlight of the pros and cons of each model, based on dozens of user comments and taking into account our above quality criteria. This is a great beginner board which rides exceptionally smooth and has an excellent turning radius. The board feels very stable, which is good for starting out, but also for cruising. The board has generic trucks, wheels and bushings that work great. The big wheels provide good grip and comfortably roll over most bumps and cracks. The deck is well built with a nice-looking bamboo finish. It’s quite stiff, providing for good control when carving. Wheel cutouts allow you to take full advantage of the board’s great carving ability, reducing wheelbite. The bearings may offer some resistance, so if you want more speed you may want to upgrade them for little money. In summary, this cheap longboard is really good for beginner cruising and carving, offering high maneuverability and speed. It’s very stable, easy to ride including for heavier riders, with a nice carving feel. It holds up really well compared to much more expensive boards out there. See pricing on Amazon. The Rimable Pintail is a good standard beginner cruiser longboard with a surf-like style and feel. It is designed for easy carving and does a fine job at it. The deck is sturdy and can easily handle a 220 lb rider. The board can really pick up speed and be taken up to at least 20 mph downhill without wobbling. It allows for smooth turning and moderately sharp turns. It’s well suited for everyday commuting to school or work a few miles away. It cruises smoothly without too much effort. The Rimable Pintail has good quality grip tape, great trucks, and decent bearings. The wheels are nice and fast with no rattling, soft enough to ride over small bumps. You may need to loosen the wheels for optimal results. Some say the Rimable Pintail rides like a Sector 9 for half the money. One small caveat is the board’s weight for carrying around. Also, keep the longboard away from excessive and prolonged heat, which has been shown to damage the deck. See it on Amazon. With its smaller size and weight (7 lb), the Quest Rorshack is great for carrying around. It may not be the best choice for long commutes or extended cruising, but once you get used to it, it’s a fun board to start learning carving and tricks. The board is a bit unstable by design, so it will challenge your sense of balance. The soft wheels, however, have good grip and stick well, making for good carving and basic cruising. The Rorshack’s deck is rigid and strong, with little flex, that’s part of the board’s DNA, along with the kicktail for quick turns and tricks. The Rorshack’s trucks are smaller than most other boards in this list, which is expected given the relatively small size of the deck. The trucks perform OK but may be improved by upgrading the bushings (a few dollars). You may want to upgrade the bearings as well since the stock ones can be a bit noisy. All in all, the Rorshack is an average board but does have its fans, due to its lean size and weight, and untamed character. With a little tuning – loosening wheel nuts, tightening the kingpin, upgrading bushings and bearings, you’ll end up with a cool and versatile board you can take anywhere and that will help you build your riding skills. Check it out on Amazon. The Karnage is another very popular cheap longboard that rides really smooth. Unlike the topmont cruisers we’ve looked at so far, this is a drop-through board, that is, the trucks are mounted through the deck, bringing the deck a bit lower to the ground. This longboard is easy to ride due to its lower center of gravity. This makes it great for cruising around, pushing with less effort, and going fast. The Karnage has good concave, resulting in more comfortable foot hold and improved control. This longboard has wide and soft wheels so you barely notice when it rolls over bumps. It’s a well balanced, very stable board for both adults and kids. The board’s turning radius is quite wide, probably due to the way the trucks are mounted. Yet the Karnage is a good basic board for cruising around and commuting comfortably and going fast. Amazon page. This cheap longboard looks and feels much more expensive than it is. Most of the riders who have tried it have been raving about it. The Sanview is very lightweight due to its hybrid bamboo deck – a rarely found material in this price range. Yet the deck is solid and durable, including for heavier riders. It has a good amount of flex and spring – one of the qualities of the bamboo material. The longboard is extremely stable, yet turns very sharp with very decent control. Its stability makes for longer rides compared with other boards. Riding it is also very smooth and quiet. The Sanview is built with high quality materials – and feels like it is. It has great wheels, good bearings, and quality hardware. The Sanview feels incredibly sturdy and well made, rugged enough for freeriding. The relatively wide deck (9.2”) in relation to length lets you perform cross step and other tricks. The price of this longboard is very attractive, as the Sanview stands the comparison with $200 boards. Overall, the Sanview Bamboo longboard is considered a superb choice for entry to expert level riders. Its outstanding stability and turning capability make it a great choice for both cruising and freeriding. See Amazon pricing. A two word summary of this longboad is “solid and simple”. Most riders agree this is not a cheaply made longboard – it was actually sold at a $150 price point in the past. It has a strong and durable deck with good flex, yet the board is very lightweight, making it easy to carry around, and to lift up and re-orient. The clear grip tape adds a nice touch to its design. The board rides smoothly with good cruising capability. It also works great for heavier riders. It’s designed for speed and performs well downhill thanks to its drop-through mount. Riders report a good set of wheels and better than average bearings. The WiiSham’s wheels have just the right amount of hardness, providing good shock absorption without sacrificing control. The trucks may feel a bit stiff initially, but over time they loosen up a bit – and as always, you can fine tune the trucks and wheels yourself. One issue you may find with this longboard (out of the box) is a bit of wheelbite despite its cutout shape. This can be improved by tightening down the trucks (for serious downhill) or fitting risers. The longboard holds up really well after many months, including after heavy use in terms of distance and crashes. Overall, the WiiSham Downhill Pro is perceived to have great value for a longboard under $60. See pricing on Amazon. The Playshion is another inexpensive longboard with great strong construction – strong enough for a 300 lb rider – and good looks with a nice simple design on its symmetrical cutout deck. The deck is extremely durable and holds up very well after months of daily use. The longboard turns relatively well and takes curves smoothly – although turns are relatively wide in spite of the 50 degree trucks. The wheels are soft for easy riding, and handles cracks better than other longboards. Soft wheels, however, mean better grip at the expense of more difficult sliding – something you might not expect from a freeride board. Carving, however, is great on this board, which smoothly handles toe-side and heel-side turns. The bearings are reported as being solid and faster than expected. The board’s trucks are somewhat tight and don’t facilitate performing tricks even though the Playshion is advertised as a freestyle board. Overall though, this inexpensive longboard performs and looks just as good as more expensive boards, and is well worth the money. Riders highly recommend it as a good beginner or casual board for the money. See price on Amazon. This longboard is officially build for downhill speed, with a lowered platform (drop through) for stability at speed, and a medium concave (i.e. rails raised higher than deck center) and low deck flex for better control in hard turns. Indeed, many riders really like this inexpensive longboard for carving hard downhill, freeriding, and even bowl/park/street skating. Being low and stable, it can be ridden up to a speed of 40 mph with no wobbling. It’s also a good board for cruising due to its low gravity center and soft and grippy wheels, providing for a smooth ride. However, the bearings could be better and should probably be replaced (or add spacers) to reduce the effort required for moving around on flat ground. Some people also swap out the bushings and get good results. The board is lightweight, and its quality is considered good for the price – including at a previous price point of $80. It holds up well against much pricier models. One caveat about this longboard is that, without adjustments, it’s quite hard to turn even at a 120º angle. One might argue this is in line with the board’s speed focus. Swapping out the tighter trucks for better turning ones (e.g. Paris trucks) typically will solve the problem. In general, this inexpensive Yocaher longboard is a quality product that serves well the purpose it was designed for. It just needs a bit of adjusting to be a great board. Go to Amazon page. The SCSK8 Natural Blank longboard is a good looking, natural wood pintail cruising board. Its deck is sturdy and reliable, with good concave and moderate flex. The bamboo layer on top makes it look like a premium board. The natural wood is very paintable, with no particular coating so that you can decorate it to your liking. The longboard is very lightweight at 7 lb. The trucks and bushing are decent. The wheels are soft (like standard cruisers), perfect for carving (but not so good for sliding) and quite forgiving on rough terrain. Riders have taken the board to speeds of 30-40 mph without wobbling, after changing the wheels and bearings (Reds) for improved speed and comfort. The stock bushings are also a bit stiff. Some riders may find the deck a bit too high and choose to remove the risers. Long time owners (2 years +) and intensive riders are happy with the longboard’s quality and performance, especially when compared with higher-end $150 boards. Some call it exceptional. You may feel turning is a bit stiffer on this longboard compared to other competing models – such as the Quest Super Cruiser (more expensive). Loosening the trucks improves things a bit. Overall, riders consider this SCSK8 longboard fantastic value for its low price right out of the box. You have the option to upgrade the trucks and/or bearings for even better performance, and to make this cheap longboard more versatile for an all around use. View on Amazon. The Volador Freeride longboard is another cheap model with surprisingly good quality and performance for the price. Lightweight for its size, it’s a very stable longboard, mostly due to its drop-through trucks. The deck is springy but strong and can comfortably hold a 260 lb rider. The grip tape is of great quality and doesn’t wear off. The board is very durable and still looks new after months of usage. Even though riders agree on its stability, the volador is agile for cutting corners, especially after loosening the trucks a bit (they are a bit stiff at first). It’s good for skate park riding as well as cruising. The wheels are durable, the bearings that come with the longboard are decent and easy to maintain thanks to the rubber shields. The board rides comfortably on bumpy ground. Some riders have taken the Volador Freeride for lengthy cruises between towns. They have been impressed by its smooth and stable riding and the lack of wheelbite issues. 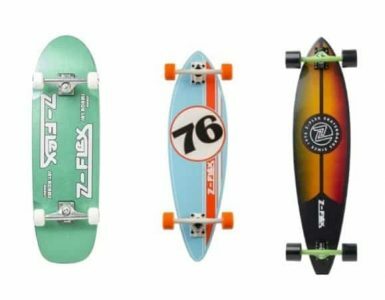 This inexpensive longboard has a quality that matches up well again more expensive models such as Sector 9 longboards, or even shortboards such as Santa Cruz and Penny. To conclude, the Volador is another longboard that is valued by riders as being worth more than its price, due to its solid build and quality parts. Check price on Amazon.